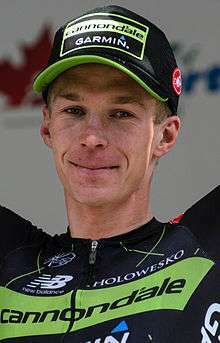 Tom-Jelte Slagter (born 1 July 1989) is a Dutch professional road racing cyclist who rides for UCI ProTeam Cannondale–Drapac. While riding for Blanco Pro Cycling in 2013, Slagter won the Tour Down Under, his greatest career achievement. Slagter won the third stage after attacking on the finial climb, cresting it alone. He was joined by three riders on the descent, and with the peloton on their heels, Slagter out-sprinted the group. 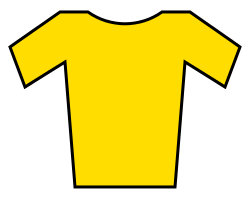 On the fifth stage, he gained the orange jersey; finishing atop Old Willunga Hill in second position, behind Australian Simon Gerrans (Orica–GreenEDGE), the defending champion. On the final stage, Slagter successfully defended his lead, with Spaniard Javier Moreno (Movistar Team) earning second place, seventeen seconds in arrears. In August 2013, Slagter signed with the Garmin–Sharp squad, penning a two-year deal. Born in Groningen, Groningen, Netherlands, Slagter currently resides in Leeuwarden, Friesland, Netherlands. ↑ Beaudin, Matthew (24 September 2013). "Garmin set for dramatic overhaul in 2014". VeloNews. Competitor Group, Inc. Retrieved 6 November 2013. 1 2 3 "Tom-Jelte Slagter at Garmin-Sharp". Garmin–Sharp. Boulder, Colorado: Slipstream Sports LLC. 28 December 2012. Retrieved 6 January 2013. ↑ "Former Rabobank (RAB) – NED". UCI World Tour. Aigle, Vaud: Union Cycliste Internationale. Retrieved 3 January 2013. ↑ Alex Malone (24 January 2013). "Slagter takes tough victory into Stirling". Cyclingnews.com. Bath, England: Future plc. Retrieved 30 January 2013. ↑ Alex Malone (26 January 2013). "Gerrans victorious on Australia Day at Old Willunga". Cyclingnews.com. Bath, England: Future plc. Retrieved 30 January 2013. ↑ "Flying Dutchman Slagter wins Tour Down Under". The Northern Star. Sydney, New South Wales: APN News & Media. 28 January 2013. Retrieved 30 January 2013. ↑ "Garmin signs Dutch rider and Tour Down Under champ Slagter". VeloNews. San Diego, California: Competitor Group, Inc. 8 August 2013. Retrieved 8 August 2013. ↑ Andrew Hood (14 August 2013). "Dutch connection paved way for Slagter's move to Garmin". VeloNews. San Diego, California: Competitor Group, Inc. Retrieved 26 September 2013. ↑ "Tom-Jelte Slagter at Cycling Archives". Cycling Archives. Retrieved 7 March 2013. ↑ "Tom-Jelte Slagter at Cycling Base". Cycling Base. Retrieved 27 December 2013. Wikimedia Commons has media related to Tom-Jelte Slagter.